The shortest way from Europe to Chile was not round the stormy Cape Horn, but across the Andes. Four days took the trip from Mendoza to reach the Chilean rails at Los Andes - by stage coach and partially by mules, up to an altitude of 4200 m or 14.000 ft, where the statue Cristo el Redemptor blessed the tired voyager. That path in the region of the Aconcagua, the highest mountain of the Americas, was in winter closed by snow for months. During the steam age the passenger from Europe, from the Sud-Express, who arrived at the sumptuous ocean terminal at Buenos Aires, could take the Transandino for the journey to Chile and also the mail took now that way across the Andes. The brothers Juan and Mateo Clark had developed the idea of crossing the Andes by rail and finally the governments of Argentina and Chile agreed. 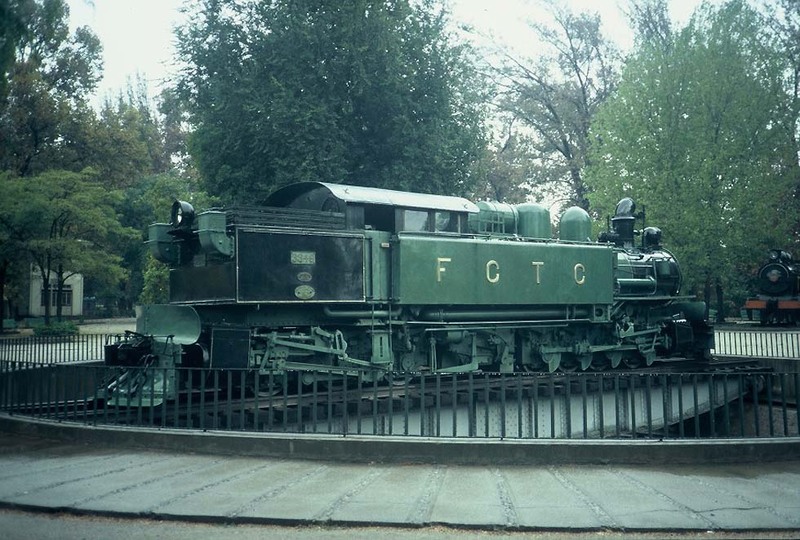 Work started in 1887, but then the governments continued and completed the Ferro-Carril Transandino between Mendoza and Los Andes, the junction with the Chilean State Railways, in 1910. It was a meter gauge which climbed up to the international tunnel at Caracoles, through tunnels, wooden snow sheds and with an Abt rack system on the steepest sections. Rack-adhesion 0-8-0+0-6-0T locomotives were delivered by Kitson-Meyer and Esslingen, the Argentian FCTA engines in black, while a FCTC Meyer-Kitson is on exhibition in Santinago de Chile with an olive/black paint. 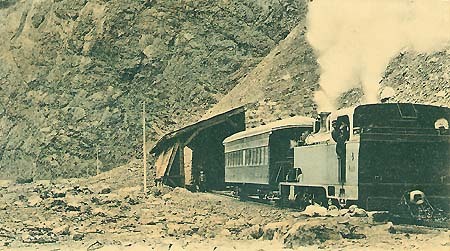 It hauled the trains from Rio Blanco through the tunnel to Las Cuevas.. Rio Blanco - Caracoles was electrified in 1923, extended to Las Cuevas on the Argentinian side in 1927. Swiss SLM rack-adhesion twin-engines were delivered, painted maroon with a yellow stripe. And a new “Pullman” train, built at Birmingham, was introduced. “The Locomotive” (April 15, 1925) reported: “For the through Transcontinental service the Joint Transandine Ry. 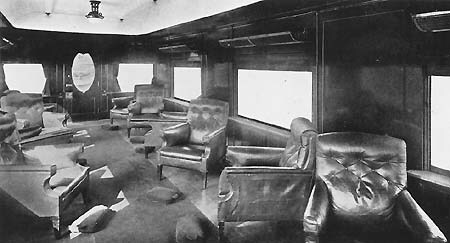 Companies have recently put into service a special train of Pullman and dining cars, the actual weight of which (…) was 146 tons… The train consists of four Pullman cars, one dining car, one combined kitchen and baggage car and one baggage car… Each Pullman car consists of a large main saloon provided with ten wicker chairs upholstered in green leather and a couch at each end of the saloon, also a small private compartment for six persons and a lavatory… the whole of the interior is of a special selected mahogany, while the metallic fittings are of oxidized silver finish. The dining car is an open saloon with two semi-cross partitions…”. The cars were completely of wood, the exterior of polished teak. Considering the weight restriction, the train surely consisted of less cars than described. In 1934 a landslide interrupted the line between Mendoza and Punta de Vacas for 12 years. Service was speeded up when in 1963 six Ganz-Mavag 3-unit diesel railcars were introduced, being able to climb up the 8 percent gradients by adhesion. 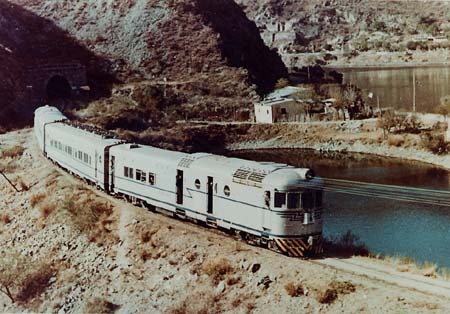 Around 1970 the timetable showed the railcar and a slower train with “Salon” and 1st class. Later railcars had a red/yellow paint scheme. Chilean diesels supplemented the electrics and small railcars came from Switzerland. 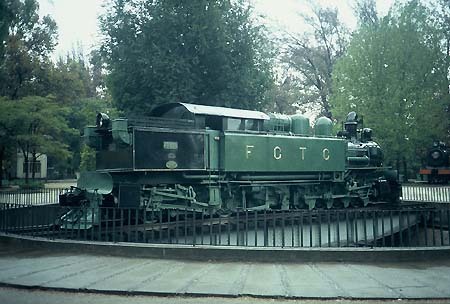 A stationmaster at Mendoza said that the Transandino was closed down in 1981, but Cook’s timetable showed already before only buses. Landslides partially destroyed the line in 1984. Nevertheless plans emerged to revive the Transandino.